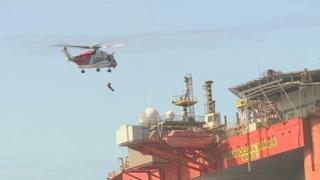 A small team of salvage experts has been lowered onto the stranded oil rig in the Western Isles. 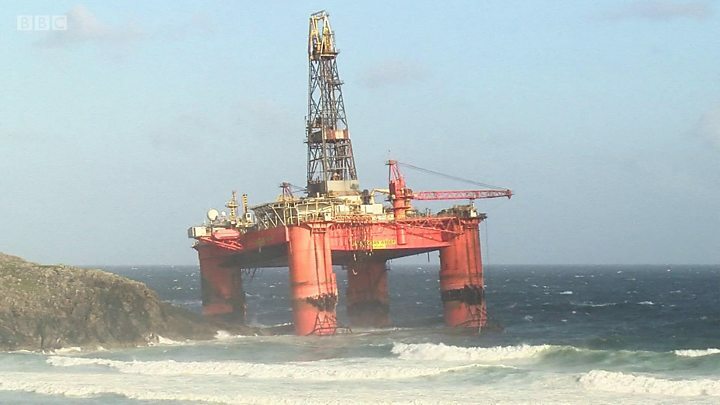 The rig ran aground on the west coast of Lewis during a storm on Monday. A more detailed investigation is planned for Wednesday but the UK government has said the work may take some time. Sightseers have been warned to stay away from the scene of the grounding at Dalmore beach. The rig has 280 tonnes of diesel oil onboard and Stornoway Coastguard has blocked access to the area. The Transocean Winner rig, was bound for Malta, when it broke free from its tug. How do you refloat an oil rig? A temporary exclusion zone of 300m has also been implemented around the rig. A spokesman for the Western Isles Emergency Planning Co-ordinating Group (WIEPCG) said: "We would also ask the public to refrain from parking on roadside verges on the main road, not to cross hazardous ground and upset livestock - particularly in the Dalbeg area. "Following the weather conditions of the past 48 hours, coastal paths are particularly hazardous and present a danger to the public who are attempting to gain access to this area." Hugh Shaw, the Secretary of State's Representative for Maritime Salvage and Intervention, said those involved in the salvage operation were moving as quickly as possible, but added that the work could take some time. Mr Shaw, who is overseeing the salvage work, said: "This initial recce will be checking a number of things including fuel tanks. "Weather permitting, it's then intended to put a second larger group of salvors on tomorrow to carry out a more detailed inspection." Three vessels including the emergency towing vessel Herakles are the scene of the grounding. Union Bear, a multipurpose offshore vessel, has also arrived at Stornoway Harbour from Aberdeen to assist in the salvage operation. Angus MacLeod, chairman of Carloway Community Council, told BBC Alba that it was fortunate the grounding had not involved another form of marine traffic. He said: "If that had happened to a loaded oil tanker the place would have been devastated. "There are a lot of people around here whose livelihoods are dependent on fishing, fish farming and tourism." Mr MacLeod added: "The community here is within a matter of yards from the shore." Events that led to the Transocean Winner coming ashore on Lewis began on Sunday evening, according to Western Isles MP Angus MacNeil. 18:15 Sunday: Crew of Alp Forward, the tug towing the drilling rig, call for assistance in heavy seas while off the west coast of the Western Isles. 18:30 Sunday: Coastguard emergency towing vessel Herakles begins its journey from Kirkwall in Orkney. 04:15 Monday: Towing line between the rig and Alp Forward breaks. 07:30: Transocean Winner runs aground at Dalmore near Carloway on Lewis. 12:30: Herakles arrives at the scene of the grounding. There were no personnel aboard the 17,000-tonne drilling rig when it became detached from a tug boat in the early hours of Monday, 8 August. The Marine Accident Investigation Branch has begun an inquiry into what happened when the semi-submersible platform which was being towed from Norway to Malta. It is understood that from Malta, the rig was to be taken to a yard in Turkey to be scrapped. Scottish Environment Minister Roseanna Cunningham said: "We are in close contact with the UK government, which is responsible for managing the response, as well as the emergency services and the Maritime and Coastguard Agency. "They are working to ensure the rig is secured and to minimise any immediate safety or environmental risks." The Maritime and Coastguard Agency said it was monitoring for any pollution from the rig. Salvage company Smit has been mobilised to deal with the incident, the agency added. The beach, near Carloway, is a well-known Western Isles beauty spot and is popular with surfers. An emergency towing vessel (ETV) has been sent to the scene from the Northern Isles. Western Isles SNP MSP Alasdair Allan and MP Angus MacNeil said the incident underlined the need for Scotland to have two emergency tugs. Scotland used to have two of the boats available to the coastguard to cover the north and west coasts before the UK government reduced the service to a single ship in 2012.